June 28, 2017 – LG Electronics USA Business Solutions today unveiled the LG OLED “Wallpaper” Hotel TV – a unique razor-thin display that becomes one with the wall – at the 2017 Hospitality Industry Technology Exposition & Conference (HITEC). The world’s first 65-inch class OLED Wallpaper Hotel TV (model 65EV960H) combines LG’s industry-leading hotel TV technology with the sleek aesthetic and unparalleled image quality of the award-winning LG SIGNATURE OLED TV W, now available on the consumer market. Thanks to their unique ability to turn pixels completely on or off, LG OLED TVs render perfect black levels – and therefore infinite contrast – to display vibrant colors, immersive details and truly lifelike images that LCD displays cannot produce. At just 3.86mm (0.15 inches) thin, the 65EV960H can be easily installed in luxury hotel suites using ultra-slim mounting brackets with a magnetic mat to create a truly seamless design that becomes one with the wall. Its electrical components are housed in the device’s Media Box, connected through an ultra-thin flat cable, which allows the panel to lie flush against the wall like a piece of art and makes installation a breeze. Even more, the Ultra HD OLED display’s inventive technology can be seen from wide viewing angles, so guests can enjoy the TV’s rich color and crisp picture regardless of their seat in the room. 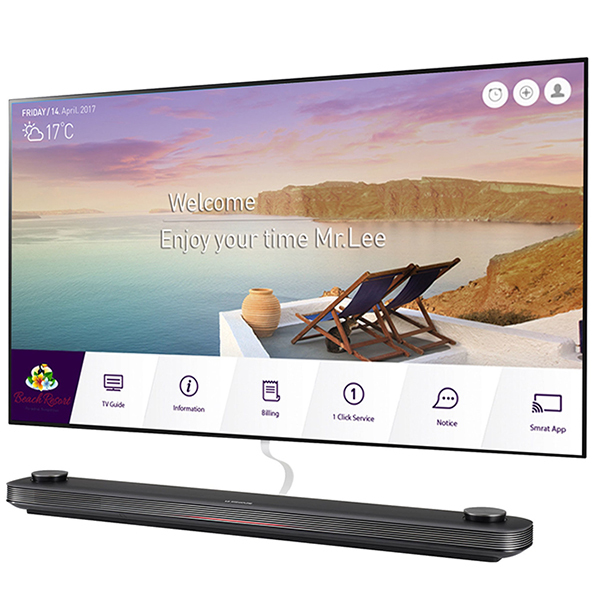 The LG OLED Wallpaper Hotel TV comes equipped with the Pro:Idiom® digital rights management system and the flexible LG Pro:Centric® Smart applications platform, which makes navigating LG’s vast content options within the interactive platforms simple and fast. The state-of-the-art display also supports leading high dynamic range (HDR) formats, including HDR 10, Dolby Vision and HLG. The TV’s powerful 4K upscaler enhances the details and colors of non-4K content on the screen’s 8 million-plus pixels. The 65EV960H is one of the first TVs in the world to incorporate Dolby Atmos sound, allowing viewers to hear surround sound like never before with overhead audio for a theater-like experience in the comfort of their hotel room. The new 65-inch LG OLED Wallpaper Hotel TV joins 55- and 65-inch class LG OLED hotel TVs (models 65EW960H and 55EW960H, respectively) for the ultimate premium in-room guest experience. In addition, a host of LG OLED commercial displays are now available for hotel public spaces. They include Dual-View Curved Tiling, Dual-View Flat, Video Wall, Open Frame, Wallpaper Digital Signage and In-Glass Wallpaper LG OLED displays. Visitors to LG’s booth at HITEC 2017 (June 27-29, Metro Toronto Convention Centre, #1619) will be among the first in the world to experience the LG OLED Wallpaper hotel TV first hand. LG Electronics USA Business Solutions serves commercial display customers in the U.S. digital signage, lodging and hospitality, systems integration, healthcare, education, government and industrial markets. Based in Lincolnshire, Ill., with its dedicated engineering and customer support team, LG Electronics USA Business Solutions delivers business-to-business technology solutions tailored to the particular needs of business environments. LG Electronics USA Inc., basedin Englewood Cliffs, N.J., is the North American subsidiary of LG Electronics Inc., a $48 billion global force in consumer electronics, mobile communications, home appliances and air solutions. For more information, please visit www.LGSolutions.com.